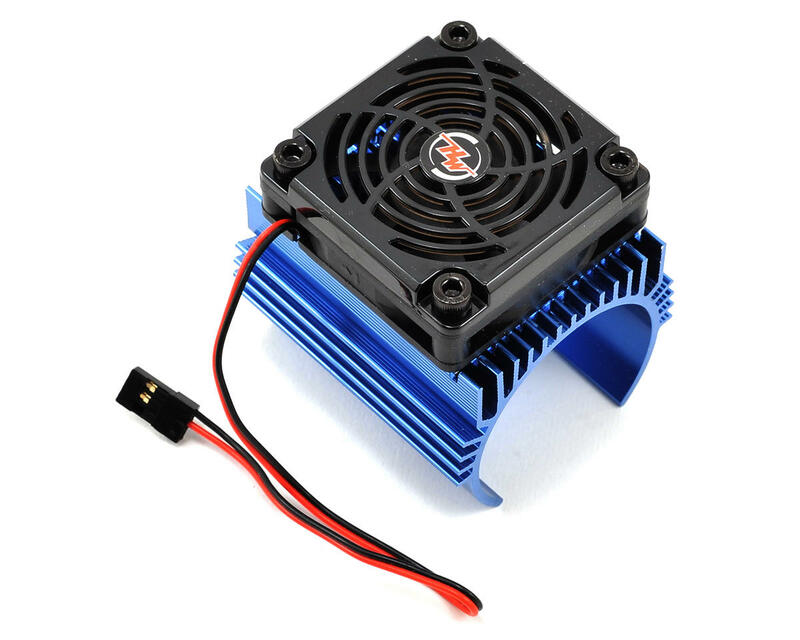 This is an optional Hobbywing C4 Motor Heatsink and Fan Combo. This aluminum housing heatsink will fit any motor with a diameter of 44mm and will help dissipate heat away from the motor. These are made out of good quality for the price. However the motor heatsink do not fit on Castle 2650KV motor. Also it does not fit well on slash 4x4. I recommend the fan but not the motor heat sink. Bought for my EB48.4 without being certain if it would fit properly out of the box or possibly with modification. The diameter is larger than either my Motiv or Tekin 1/8th scale motors. Also it is too long to fit without modification. I trimmed off about 1/4" from one side. I then reduced the diameter by squeezing the legs in a vice. This reduced the diameter to just about perfect but it's not quite perfectly round which could leave some air gaps. The next issue is fitting it into the EB48.4. It fits but with the Tekno's smaller body would require substantial trimming to be workable. At this point I've determined to find another solution. Seems like a good product although perhaps best suited for whatever Hobbywing product(s) it's specifically intended for. Great buy for the price. Using on my castle 1515 2200kv motor. Requires some bending to fit the motor.